Just a girl with big hair working her way through the kitchen. It’s been on of those weeks where you over think everything & nothing seems to go how you imagined it would go. I sometimes, well I shouldn’t say sometimes, I a lot of the time over think situations. I’m a planner & a thinker. I expect things to be one way because of how I was raised, but i’m learning that things aren’t always as black & white as they may seem. Not everyone feels the same way you about things & that is ok. People move at different paces & that’s ok too. I need to accept that how I picture/want things isn’t how they will always be & THAT’S OK. The planet will continue to spin & the sun will continue to shine. This is probably a lesson people learn in their teens and not in their 20’s but ya know what, not all of us learn things when we should. So I made this AMAZING chicken salad recipe last weekend and a number of months ago. Every time I eat it I fall in love all over again with chicken salad. It’s not your traditional chicken salad and that’s probably why I love it so much. It’s heaven in a bowl if there was ever such a thing. I’ve been trying to get my boyfriend to experience new flavors and new foods. We’re both trying to eat healthier and watch what we’re consuming when we’re together & apart. It’s not easy, but we’re trying. He was never really much of a food person, by that I mean, before we started dating he was basically living off of banana & peanut butter sammies. Now don’t get me wrong, I love me some banana & peanut butter from time to time, but not multiple times a week! Just no. So when I told him I was going to whip up some Greek yogurt chicken salad for lunch before he went riding, he was a little hesitant to try it. He also was a little nervous about the whole idea of grapes & apples being in chicken salad. I told him to just trust me on this one, I knew he was going to love it. And guess what – he loved it. He took one bite and couldn’t stop complimenting how good it was. I had to pat myself on the back! Lol! 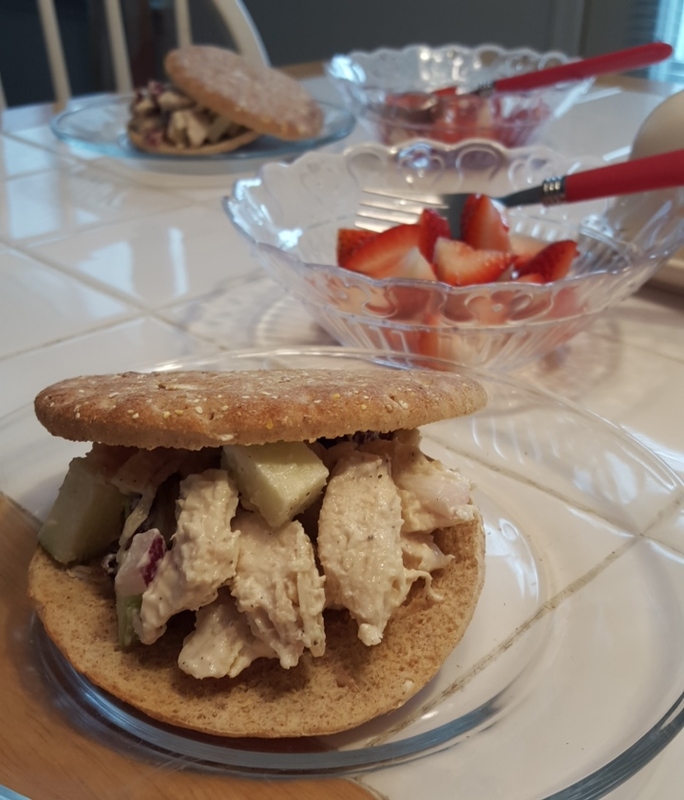 So without further ado – here’s my slightly adapted version of the Greek Yogurt Chicken Salad Sandwich recipe on the Damn Delicious blog. Preheat oven to 450 degrees. While oven is preheating line a baking dish with tin foil & lightly spray with non-stick cooking spray or drizzle with olive oil. I used 2 large chicken breasts in my chicken salad.. I think they weighed around 1.3 lbs for the both of them. I would use at least 1 lb of chicken, but 1.5 or slightly less will be just as perfect! Trim the fat off of your chicken breasts and discard. Sprinkle each side with a little bit of onion salt & pepper. Place chicken in baking dish. Once oven is preheated place baking dish with chicken inside of oven and cook for approximately 10-12 minutes on each side depending on how thick your chicken is. Since we are simply shredding the chicken for this recipe feel free to cut it in half to make sure the chicken is cooked through & no pink remains. While the chicken is cooking, begin slicing grapes into quarters, dicing the red onion & dicing the granny smith apple. Place in a large bowl along with the dried cranberries, sliced almonds, plain Greek yogurt, lemon juice garlic powder & salt. Mix until everything is covered evenly. Once chicken is cooked let it cool slightly before you begin shredding with a knife & fork. Add to the yogurt mixture and allow to cool, covered, in the refrigerator for at least 2 hours. For a slightly healthy sandwich, serve with sandwich thins or atop of a bed of lettuce. The chicken salad is so good you’ll probably eat it straight from the bowl like me! looks great. i used to find grapes and apple weird with chicken too. but i enjoy them now in chicken salads. It’s a great combo, especially for the summertime! !